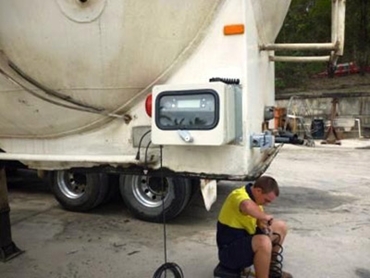 An Accuweigh payload monitoring system was recently fitted to a cement tanker in Queensland to prevent accidental overfilling. Supplied and fitted by Accuweigh’s QWM branch in Brisbane, the TruckWeigh payload monitoring system alerts the driver when the tanker is nearing legal load carrying capacity. Accuweigh’s payload monitoring system not only prevents penalties for overloading but also environmental issues that may be caused by the overfilling. The payload monitoring system triggers a warning alarm when nearing capacity to give the driver adequate time to stop the filling process. Accuweigh’s TruckWeigh payload monitoring system used for the cement tanker comprised of two different sensor technologies: Air bag pressure sensors fitted to the prime mover’s suspension; and sensitive electronic sensors fitted to the leaf springs of the tanker’s suspension. All calibration data is stored digitally onboard each vehicle component to allow trailers and prime movers to be readily interchanged. The digital weight indicator automatically uploads the required calibration data from the mating truck/ trailer component(s) and then displays the correct weight readings of the combined units. Accuweigh is the exclusive Australian distributor of the UK based PM Onboard, a leading manufacturer of onboard vehicle weighing systems. Accuweigh is the market leader in payload monitoring technology and has operates eight branches across mainland states providing superior product support.